Upon his graduation from Texas Christian University, Mike Renfro held virtually all of the schools’ receiving records, and was the Southwestern Conference’s all-time leading receiver for receptions (162) and yards (2,739) . 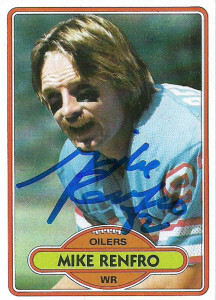 The Houston Oilers drafted Mike in the 4th round of their blockbuster 1978 draft. To say that head coach Bum Phillips was not enamored with kids from the SWC that year was an understatement as Renfro joined fellow SWC rushing leader Earl Campbell as rookies on the team. Mike was fortunate. With Billy White Shoes nursing a knee injury, Renfro was able to begin building a rapport with quarterback Dan Pastorini, while honing his blocking skills. Later in the year Mike scored his first professional touchdown against the Oakland Raiders. It’d be in the 1979 playoffs the next season, that the team met with that heartbreaking bad luck they always seemed to find in the oddest ways. The Oilers’ battles with the Steelers were titanic by this point and Houston was one of the few teams that was formidible in combat with Pittsburgh. The Oilers rode into 3 Rivers Stadium for the AFC Championship Game that year. Trailing 17-10, the Oilers drove down the frigid field, after starting from their own 14 yard line. Pastorini was hot on Renfro that drive, already striking to him for 21 yards to put the ball on the Steeler 6. 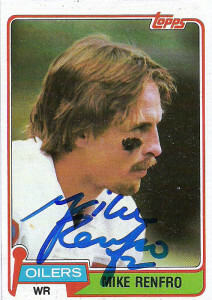 It’d be on the next play that Renfro is perhaps remembered most for. Under a nasty rush, Pastorini lobbed the ball up in the air to Mike over the helpless defensive back Ron Johnson (who held Renfro). Despite the no call hold, Renfro pulled the ball in and cradled it before stepping out of the endzone. The side judge, made an initial no call, then made a weak incomplete pass signal. While the replays showed otherwise and the commentators agreed as such, there was nothing that could be done. The Oilers settled for a field goal, and this was the closest the franchise ever made it to the Super Bowl. The Steelers scored a final touchdown with 53 seconds remaining to inflate the score to 27-13. The play caused a national firestorm and debate over the sport. The call today is still regarded as one of the worst made in sports history- ever. While video replay had been in use going back some 20+ years prior, the major sports had been reticent to adopt it as a way to better assist officials in making better calls in games. The USFL became the first major football league to open the can of worms and adopt instant replay formally in 1985. The fans universally appreciated the program, seeing it as a sign of fairness and transparency. The NFL finally followed suit in 1986. After a lot of trial and error, the program was modified, abolished, and reinvented by 1998 and has been in use with minor tweaks every season since by the league. Mike played with the Oilers for the next 4 seasons. As a run first team, Mike got the knack of being a fearless, possession receiver who had great hands and ran fine routes. Renfro’s stats, especially compared to other receivers (of this current time) hearkens to a bygone era of aggressive defenses and the Dead Ball years of the sport. He finished his tenure in Houston with 160 catches in 51 games for 2183 yards and 11 TDs. Mike was also witness to the dawn and sunset of the Earl Campbell era as well as being one of the last remnants of the old guard to move on before the beginning of the Moon era in 1984. That year, Mike found himself traded to the Dallas Cowboys in exchange for WR Butch Johnson, and a swap of 2nd round picks between the Cowboys and Oilers. Oh the Oilers also threw in a 5th round pick as well, which the Cowboys used to draft some guy named Herschel Walker. In essence, the Cowboys can thank the Houston Oilers for the catalyst that propelled them into the dynasty they became in the 1990s. Renfro stepped into the Cowboys organization at a critical juncture as well. He became the go to man for young quarterback Danny White as the team transitioned between eras at wide receiver from Pearson to Irvin. Mike was there to pick up the slack when Tony Hill began to decline and Mike Sherrard broke his leg. Mike posted a career highs in receptions (60), yards (955), and TDs (8) in 1985. Mike is also remembered fondly for having one of the greatest Thanksgiving performances in memory in 1987 when he caught 7 passes for 100 yards and 3 touchdowns against the Minnesota Vikings. Sadly though, Mike was at the end of the line after finding a new role in Dallas. In 1988, Michael Irvin joined the squad, and with a host of new talent at receiver, and Renfro banged up from the wear and tear over the years, knew it was time to go. No hard feelings for Mike though. Retiring to the Dallas area, Renfro was a sucessful investor and horse breeder for a while. I had written Renfro back in 2010, but did not receive a response because I had gotten the address partially incorrect. I did not realize that the error was on my end until I had recently seen some responses from him. I was happy to finally get him on these two Oilers cards. Mike also makes an appearance on the original Tecmo Bowl on the Nintendo Entertainment System.